We have just returned from our trip to Phuket and wanted to thank you for making it a memorable holiday. Our ‘taxi’ was waiting for us when we docked and we were greeted by your very friendly guide and driver. The taxi was was a real luxury far more than we expected most comfortable and roomy and the provision of flannels and water and soft drinks was an additional delight. Your Guide ‘A’ was most informative and friendly and it was nice to learn so much from him about your culture and customs and so informative about the places we visited. Your driver MR Ton? was an absolute delight he was so helpful and nothing was too much trouble even to meeting us with pac-a macs as we left the ship dock as it was raining so heavily we would have been soaked and buying us coconut milk drinks when we were in town. he really made the rest of our stay in Phuket most enjoyable. I just wanted to email you to say a huge 'THANK YOU' for making our transfers so easy and utterly fantastic. Both legs of our journey were handled with the utmost professionalism and punctuality. We are looking to bring our two boys to Phuket next year and we will definitely be using your company again. I just want to say thank you very much for the amazing trip we had with your company. All of us agreed that the trip to Phang Nga Bay was the highlight of our trip to Phuket. Please also convey our gratitude to Bee. She was a wonderful tour guide. You have a real gem in her. She made the trip one to remember. If we are ever fortunate enough to visit Phuket again, we will definitely book another tour with you. We will (and already have) recommend you to other visitors to your beautiful island. Excellent Service and response from Easy Day Thailand !...Punctual and accurate, excellent transportation service, the MV sai boat for the sunset cruise was too good !! ..
Francesco is a gem of a person, never ever late or shy in replying to emails, prompt and accurate and even suggests what is best for us !..Very polite and gentle in talking. Thanks Francesco for everything ! Our guide was Bee, another gem of a person and very friendly. Thanks Bee ! !..And thanks for emailing the photos taken from your mobile.. Thanks to all the staff and people behind this..
And tell Francesco I am really v v sorry that I forgot about returning the mobile. But I have kept it safe, and if I ever return back to Phuket again, I shall definitely return it back to him. ! We reached safely yesterday evening. Would like to thank you and your team for arranging everything well and orderly during our visit. We really had a nice time and my kids really enjoyed a lot. Thanks for all the arrangements and recommendations you made. A very special thanks to our guide Bee, who was very friendly and took good care of our kids. Give the special regards to Aunty Bee from my kids Alitza and Austin. Both the drivers, the Captain, his wife and little Ki at the Sun Set dinner, all were really good and made us feel at home. Really was a good experience. Once again, thank you very much. Will recommend you to my friends and will contact you in future if we are visiting Phuket again. Thanks so much for arranging our day out today. We had a really good day and enjoyed going up to Big Buddha and had the best meal in the most beautiful garden and could not believe how reasonable the prices were as well. Definitely rated as our second favourite meal this holiday. We enjoyed Kok Chang and although we come from Africa and are not partial to tamed elephants these elephants were cared for and on our short trek we found an elephant of theirs up in the trees grazing and enjoying freedom. All in all a very good day and now we are in KL awaiting our flight back to Perth. Thanks too for arranging our superb day to Phang Nha. The lunch we had their we rated our most favourite and tasty meal. I also loved the coconut sweet treats cooked in banana leaves that we tried with coffee on our way up to Phang Nha, they were delicious. Your organising definitely made our trip so easy from our airport collection to our ferry pick ups and trip to Phi Phi and getting us back to the airport. Tony & I have just returned from our private tour of the James Bond Island with Bee and Mr Pual. We have had the most fantastic day and wish you to know that both Bee & Mr Pual were exemplary and looked after us very well indeed. Bee was very informative about the island and the village on stilts, we also visited a cave temple. Bee is a credit to your company and we thank her for a wonderful day. Everything went according to plan, the long boat, the sea kayak and the lunch, well done, we really enjoyed ourselves. We wanted to thank you both for making this trip happen for us. We all had a great time and your suggestion for me not to go on the speedboat was absolutely the right one. I had a fantastic time with my daughter on gorgeous Long Beach, whilst my husband enjoyed the speedboat tour. Thank you again very very much for your efforts and apologise for the many back and forth emails. 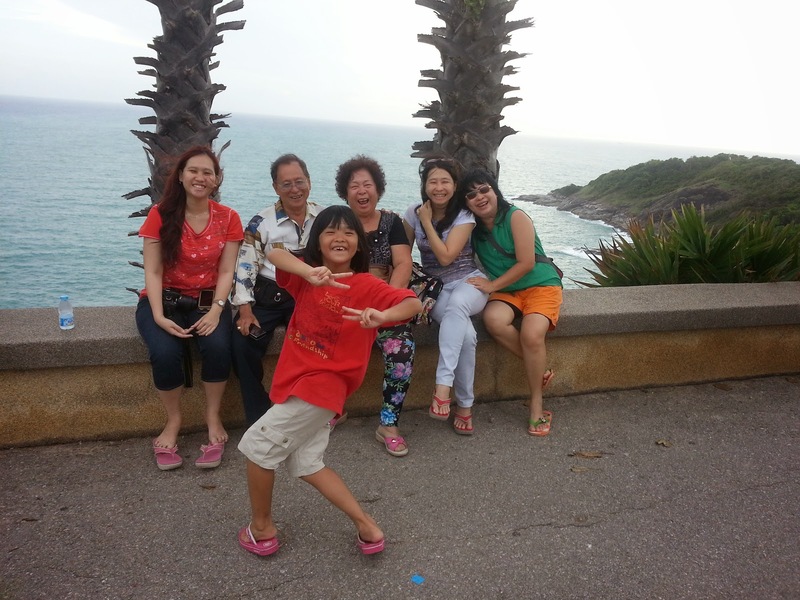 I will certainly recommend your company to family and friends visiting Phuket. Thank you! It was a great tour. Bee was fabulous. I've already done a tripadvisor review:). Thanks again! We enjoyed it. We had a fantastic day on the Racha Yai tour, it was lovely and great value. The staff were so helpful especially with my Mum. They helped her in and out of the boat and guided her when snorkelling. The other tour was not so good. It was bad weather and to be honest the description of the tour was a little misleading as we did not see the James Bond Islands. The tour guide Julie had a sweater on and kept saying how cold she was. We couldn't see anything due to the bad weather and we kept getting wet due to the high waves. It was so rough that we did not dare go to the toilet as the boat was lunging from side to side. There was only beer and very cheap wine to purchase and no spirits. The food was freezing and we had no lights at the back of the boat. The toilet at the Marina was in a terrible state and if we had know it was going to take so long to get to the Marina we may not have gone in the first place. I really think you should speak to the owners and recommend that they do not go out in bad weather. Everyone on board was expecting something much different, some people got dressed up for the occasion only to be covered in sea spray. It was a disaster and the worst tour I have ever done. As it was my Mums birthday I wish I had taken her for a nice dinner instead. I will post a nice review on Trip Advisor for the other tour as I really enjoyed that one but not the other one. The staff at your company were excellent and I will definitely recommend your company to others. Just a short note to thank you for your excellent service and planning which made our holiday in Phuket so enjoyable. We had a fabulous time. No hassles whatsoever. Don't know whether you arranged the weather as well, but we were blessed with lovely warm and sunny days. We were very impressed with the level of service we received. The tours we choose were super. Pick up and transfer from the hotel to the boats or the shows was always on time. Once again a huge thank you. It was a pleasure doing business with you. Dear Easy Day people's, I don't exactly know who to send this to, so I might as well CC this to everyone :s Sorry before. Sorry again for not writing sooner. Been busy with stuffs. But here I am. Here's my review and feedback for everything. Loved the service and friendliness during my email exchange with Francesco. Actually, I contacted several tour agents to help with my trip. 2 replied, Easy Day Thailand and another I will not mention. Francesco replied with a more friendlier way and makes it more comfortable. So I went 'yeah drop that unfriendly tour'. Replies came a bit late during the first emails but after a while it came super fast. I even said to my family 'I just wrote the email in the morning and the reply came in the evening, this is amazing.' Loved how richly informed I am. It's like I don't need to ask anything anymore. we arrived very late due to the problems inside the immigration. Probably 1 or 2 hours late. Found Bee waiting outside with my name and can clearly remember how relieved she was after I approach her. I felt really sorry. The driver picked us up in a moment and we were greeted with cold water and refreshing towels (which I have never seen before, yes.). Bee did a great job in capturing the hearts of grandpa-grandma even though she speaks little Chinese. Applause. Bee then gave us rambutan just after my mom saw a rambutan in display and got excited by it. The whole van went 'wooow'. Aunt complained about the driver to Bee and amazingly the driver drove much better on the next drive. It's like switching things lol. Official stops on that day was Big Bee Farm, Thai Hua Museum and the Phong Phang Restaurant. My family was enjoying themselves too much in Big Bee and literally had to tell them to be quick every minute. Bee helped to take care of the terrible 3, same thing at Thai Hua Museum. Thanks for taking care of the kids, Bee. Went to have lunch in a seafood restaurant that offers really good seafood. Got to try fresh sea crab here. Shortly saying, the foods here are great and had to thank Bee for ordering these. We even stopped at a fruit market and everybody went on a fruit rampage. Bee is so facilitating. I thought we're going to go to many places for the Heritage tour, but well it's probably because we're late. The 'advanced smartphone' that was lent to me came in handy. I called Francesco like twice or 3 times a day to ask this and that. And he skillfully answered my questions. Met Ann the new driver today and she's really amazing. She helped us carry the luggage and mercifully took us to a place for lunch even though it's not her responsibility. Thumbs up. Went for a Weekend Market tour with Bee and Ann. Bee helped us all night (taking care of the terrible 3, still) and helped us haggle prices with the seller. Bee also introduced us to many market snacks that's very good and a totally new experience for us. Private Phang Nga Bay tour today. It's a total feast for the eyes because the view was amazing. The Longtail boat sometimes provide random refreshing sprinklers lol. Bee actually brought us a raincoat but the boat provides a bit cover, so it's not really necessary. Thanks for the raincoat anyway/ The adults and terrible 3 were dropped at James Bond Island, while Bee and grandpa-grandma crossed with a boat. Loved how Bee was really understanding with the oldies. Next stop to the Pan Yee Village where we had our lunch and went to visit the village. Enjoyed this day very much. The Phuket Island sightseeing for today. Bee was really good with arranging the trip today because we went to lots of places to buy souvenir and foods and the kids wanted to visit the aquarium and go elephant trekking. All in one day, perfectly arranged. Departed to Raya Island on this day, and had a little argument with the boatman over there over the receipt(sounds a bit unnecessary, but it happens). Turns out the trip to Raya Island is with a speedboat, my newly introduced nemesis. The speedboat trip literally made everyone in the boat soaking wet. The floating bridge in the island was also a horror. Just horror. Thank God that I didn't fell over the bridge. Called the Easyday hotline for my family's last minute decision and last minute cancellation. Really appreciate Easy Day for keeping up with me and my family. Got into a miss communication with the receptionist in the hotel. I don't really know the details of the dispute because it's between my aunt and receptionist but according to her, the receptionist was being unfriendly and misinformed her. Anyways, we checked out the resort went through the horror of floating bridges and speedboat back to Phuket. Easy Day was very nice to let us borrow the office to change and rearrange the luggage because we're going straight to airport. Bit of a hassle, but everything's good till the end. The driver dropped us at Terminal 1 when we're supposed to be at Terminal 2. Had to drag all the luggage down a set of (long) stairs that made most of my family (bit) upset. Overall very satisfied till the very bit. Thanking Francesco for the helpful emails and patience with my calls, thanking Bee for always taking care of the terrible 3 and was very understanding with us. We traveled with many travel agents, met many tour guide. Have to say Bee is probably the best till now. Even my family loved Bee. Thanking Ann and the other driver for driving us to places. Have to admit my family is a demanding family, with lots of different demands and sometimes last minute decision, but Easy Day kept up with all of it and amazes me and my family. Will blog about you and spread out how good you guys do your job. Praying for Easy Day's future successes. Sorry this note came late – was busy taking care of my son’s injury the moment we touch back home. Just wanna say THANKS for the GREAT arrangements – my family and I simply LOVE the program especially on the trip to James Bond island. who drove us around – and both of them brought us to what we “wanted” J - Durians and Mangosteens JJ. Easy Day Thailand is GREAT service. my experience on the recent Phuket trip, do let me know. OVERALL – I am very glad to know you, your patience and detailed works are perfecto. My family and I already plan to return to Phuket next MARCH – I guess AUG-DEC is raining season right ? and for sure I will get in touch w you. My son and I will want to go Flying Hanuman. And we will go Phi Phi Island, Water Rafting ++ and whatever nice programs you will have then. Till we meet again real soon J…….THANKS ! We have just returned from our 2 day 1 night trip and would like to provide you with some feedback. Overall I think the tour was satisfactory but there are a few aspects of the itinerary where I feel very short changed and that things could have been better. Firstly our stop at the Tsunami museum was something we were looking forward to very much, but when we arrived there I could have easily mistaken it for a market stall, the only give away was the fact the owner was selling Tsunami magazines at 300 baht, over 3 times the price printed on the front! And what a museum comprises of in my head is more than a 1 metre wall with a few faded photos on it. Our next stop at the 'Monkey Cave' was exactly that, a pit stop. The cave was off limits but in fairness we did see some monkeys. The elephant trekking was really good but only lasted 45 minutes instead of the advertised 90 minutes. Lunch was a highlight. Everyone enjoyed the food! We then worked our way to the raft houses on the lake, they were brilliant set in even better surroundings. Dinner was fantastic however our night safari was a bit of a joke. Our guide told us 5 minutes in that they have never seen anything before and that we should do it on the morning if we wanted to see any wildlife, but then that wouldn't be a 'night' safari would it? We headed back shortly afterwards via a tree stump which nearly flipped the boat, I know this could have happened to anyone but at that point it only added to a disappointing experience. The morning safari was combined with the boat ride across the lake to the rainforest trek starting point. Our guide through the jungle was very enthusiastic and fun, Bra did her best to show us as much wildlife as she could find. The trek bought us to the motor powered bamboo raft jetty. Which we used for our 10 minute crossing to the cave on the lake. The cave tour was interesting and enjoyable. We left the raft house at 12.30pm after another good lunch. We got to our minibus changeover point at 2.10pm, to find we would have to wait for around an hour for a group of Russians who were at that point rafting, motor free, down a river. Could this spare hour not have been spent better, like at the raft house maybe..or joining in with the rafting? Tara and I did both enjoy the trip as a whole but don't feel it justified the cost we paid. My overall disappointment lies in the fact that we could have booked the accommodation and the worthwhile activities ourselves at a fraction of the cost. We chose however to book with a credible company such as yourselves (knowing this would cost more) on the basis that your company would have spent good time on planning the perfect itinerary. I wanted to email you personally about our feedback as I do like to leave TripAdvisor reviews and wouldn't like to be unfair by publishing negatives without approaching you first.